Comes in a glass jar with 14 ounces of raw, organic, creamy coconut butter. If you know about and enjoy the many health benefits of premium coconut products, you’ll most likely love this raw, organic coconut butter product – it’s made by Artisana, a company that specializes in producing the highest quality and best tasting coconut and nut butters. This coconut butter is made by using a special blending process that transforms raw coconut meat into a buttery texture, one that has the wonderful fragrance and taste of coconut oil, but also provides more substance; whereas coconut oil mainly consists of healthy fatty acids, coconut butter contains all of the nutrients found in fresh coconuts, including healthy protein and fiber. How can you use this certified organic and kosher coconut butter? Our favorite way is to eat it by the spoonful, straight out of the jar. But we also enjoy adding it to smoothies, banana ice cream, and a variety of healthy dessert recipes, all of which you can find in our healthy recipes archive at http://drbenkim.com. Worried about the saturated fatty acids found in coconut? You should know that you cannot live without healthy saturated fatty acids, which provide significant structural support to the membranes that protect all of your cells. Also, the saturated fatty acids found in coconut are medium-chain fatty acids (MCFA), which are taken directly from your bloodstream to your liver, where they are converted to energy. This means that the MCFAs in coconut can provide an almost-immediate source of energy for your body and might even speed up your metabolism. Other fatty acids and even excess carbohydrates can be stored as fat in your cells—so if reaching and maintaining your ideal body weight is a concern, coconut butter is actually one of the best food choices you can make, provided that you don’t overeat. Our experience has been that the naturally occurring fiber in coconut butter makes just a small amount quite satisfying. 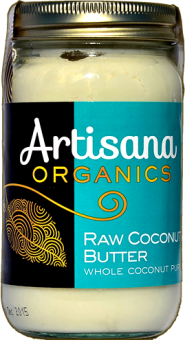 Artisana Organic Raw Coconut Butter requires no refrigeration—either before or after opening. This is due to the inherent stability of the healthy fatty acids found in coconut butter. Unlike almost all products that contain other vegetable oils, coconut butter contains virtually no trans fats. Product Specifications: this exceptional organic, raw coconut butter is made by blending together electrolyzed water, premium coconut oil, and premium coconut meat. The end result is a fiber and nutrient-rich butter that we feel is one of nature’s healthiest and most delicious foods. This raw, organic coconut butter is certified organic, certified kosher, and comes in a glass jar. Notably Absent: pesticides, artificial flavors, colors, preservatives, stabilizers, added oils, GMO's. Completely free of peanuts, gluten, and dairy. Oil separation occurs naturally; stir before serving. Please note: for most cooking purposes, for skin moisturizing, and for hair moisturizing, we recommend our premium coconut oil over coconut butter. Even one spoonful satisfies any sweet cravings! And I know that it offers so much more in health benefits. Love this stuff! OMGosh, this is FANTASTIC!! It's actually difficult to stop eating ;) ! I was so excited that it tastes so good b/c I just can't eat the coconut oil straight. I can eat it mixed in with things (a lot of things! ), but after reading about so many people saying how great the oil tastes (even on a spoon right out of the jar), I was disappointed that it just wasn't for me. Now I can get all of the benefits of the oil with this terrific butter (and the benefits are the same per the contact people on this web site)! When I don't have much of an appetite but need to eat (usually breakfast time), I'll just get a spoon and eat of couple spoonfuls of this. It is definitely my go-to breakfast and any other type of meal/snack when I don't want to eat anything else.